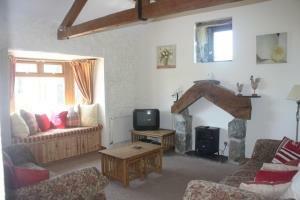 Cefn Coed Cottages Self-cateringCefn Coed has 3 cottages for hire. Beudy has 3 bedrooms; 1 king with own shower room, 1 double and 1 twin. It also boasts a separate kitchen, lounge and bathroom. Sgubor has 3 bedrooms; 1 double, 1 twin and 1 twin/superking. There is a combined lounge and kitchen, a downstairs shower room and upstairs bathroom. Cegin Foch has 2 bedrooms; 1 king size and 1 twin/superking. The king bedroom is a galleried bedroom over the lounge and kitchen. This property has a downstairs bathroom. All have enclosed gardens with patio areas, picnic tables and great views. All cottages are fully equipped. Cefn Coed has 3 cottages for hire. Beudy has 3 bedrooms; 1 king with own shower room, 1 double and 1 twin. It also boasts a separate kitchen, lounge and bathroom. Children are particularly welcome as are dogs at Cefn Coed. In addition to the well equipped accommodation on offer, Cefn Coed has a safe, children’s play area which is conveniently located to all three cottages so that children can be supervised whilst playing. Car parking is within close proximity of all cottages. Conveniently located being approximately 2 miles from the nearest beach, Cefn Coed is also within reach of numerous other sandy beaches, most of which are of blue flag status, as well as excellent sailing facilities at the marina in Pwllheli. The mountains of Snowdonia including the Carneddau, Glyderau and Rhiniogs are all within easy reach by car and offer a great day out for the both experienced and novice walker. Beudy is adapted for the disabled, it's all on one level has hand rails in bathrooms shower chair etc. Children welcome from any age. From Porthmadog follow A497 through Criccieth, then turn and follow B4354 to Chwilog. Property is on right before you reach Chwilog.